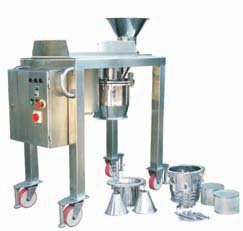 The Riddhi Cone Mill incredible advantage lies in accomplishing size reduction with low heat, Low dust and low noise. The machine finds immense processing applications in a variety of Industries including Chemical Process Industry. Pharmaceutical Industry & Food Industry. Can also handle a surge feed. Easily changeable Screens and Impellers. Stainless Steel construction – ideal for Food & Pharmaceutical Processing. Provides option of inline milling. Belt Drive, Controlled thru AC Drive. A conical impeller is mounted on a shaft fitted through a suitable bearing housing and stuffing box. The entire assembly is mounted on a suitable SS platform and column. Through bottom discharge hopper by gravity into the collection bin. All drives enclosed with guards.